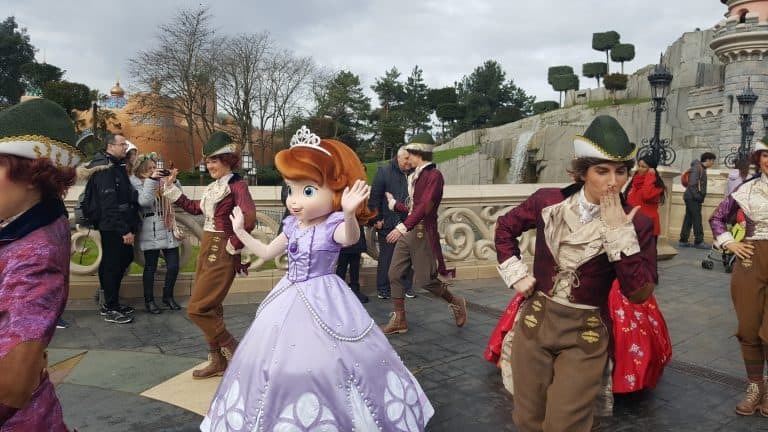 The Easter weekend brought a new season to Disneyland Paris: the Festival of Pirates and Princesses. During the two-month event, characters like Rapunzel, Cinderella, Captain Hook, and Peter Pan will play a key role. There is also attention for lesser known (Disney Junior) characters like Sofia the First, Elena of Avalor and Captain Jake. We traveled to Paris in the first week of this new season to check it out for ourselves! Disney Pirate or Disney Princess: Make your choice! This show/parade/spectacle is the big headliner of the festival. It starts at opposite ends of the park, leading to a performance of one team on Main Street, U.S.A. and one team at the Royal Castle Stage in Fantasyland. The big finale is on Central Plaza, where guests can choose the side of their favorite characters during a musical face-off. It is performed four times a day. First, the separate shows. I started my day at Team Princesses, led by captain Betty Rose and Mickey Mouse. The princesses were given new dresses for the occasion and although some were critical on the new, fresh looks, I think they fit well during this special season. The show featured several dancers that interacted with the audience by giving high-fives and posing for pictures. The whole bunch of princesses moved to Central Plaza on a float from Disney Magic on Parade (2012) repainted and updated for the festival. Where the princesses stick to their gracious fantasy theme, the pirates have a different look. The big ship (also from Magic on Parade) is painted in different colors and the costumes of the dancers correspond to this pattern. At first, I was sceptical about this colourful pirate look, but now, I believe I see why they fit with the music and the act. The pirates, led by captain Jimmy Ocean and Minnie Mouse, are a chaotic bunch of characters that know how to perform, with dancing and trampoline stunts. During the face-off at Central Plaza, the floats are parked on the left and right. The lampposts are themed to represent the teams. After arrival, the characters enter the stages that stand in the topiaries in front of the castle. This is the start of a 360-degree musical spectacle that dominates the whole center of Disneyland Park. I feel like this is important for the whole show. Because of the size, it truly is a ‘Festival of Pirates and Princesses’. So, what are the cons of this show? To be honest, I found it hard to find them. I do not like the way the empty stages lie in front of the castle most of the time, but it is nice how they are used during the show. I still think the pirates are a bit too colourful and should look more like the pirates in Hoist the Flag, Mateys! (more on that in a moment) because of their lack of seriousness. I mean, they are pirates after all! As written in the beginning, there are also appearances of Disney Junior characters. While Captain Jake has a place in the big Make your choice-show, Sofia the First and Elena of Avalor get their own show. Although, it isn’t really a show. The two princesses start on the bridge of the castle, walk around a Central Plaza with a group of dancers, and return to bridge for one short photo-opportunity before heading back. This takes a couple minutes and was so slow that I did not manage to take a good photo (sorry), so be quick! Since the characters are from Disney Junior, I can not understand why it is all so quick. I do not believe young children really get a chance to really ‘experience’ these characters. Children that want to become a pirate can take lessons from Jack Sparrow himself. In this show, a pirate (with a band) announces that Jack is looking for new pirates and the children in the audience can participate in three small actions, like hoisting a flag and doing a distraction trick, before they are rewarded with a pirate certificate. The show is a lot of “look what Jack is doing and look how kids repeat it”. It might not sound like it’s worth watching, but there are some nice (musical) jokes and seeing how the children react and play with the pirates is nice entertainment. Doing a pirate show in front of the pirate ship in Adventureland might sound like a good idea, but there is not a lot of space. 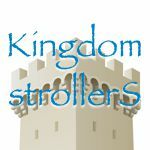 Be prepared for narrow pathways and parents that are willing to push to put their children in front of the action. It is a good thing that the show is performed six times a day, to spread the crowds. The Festival of Pirates and Princesses is not complete without special merchandise and food. The merchandise was nice but I forgot to take photos (sorry, again). I did manage to grab a special cupcake at Market House Deli on Main Street, U.S.A., that I ate during a performance of Disney Pirate or Princess: Make your choice! I can really recommend the pirate flavor! After what you have seen, what are your thoughts on this new Festival of Pirates and Princesses? After the two sides meet in the central stage, do they return back the opposite way with a stop at castle stage and Main Street? Ie, if I go to the castle stage will I be able to see both groups during the same performance time or will I need to go twice? Hi Lesley! If you want to see both shows on Castle Stage, you have to see two performances. After the meeting on Central Plaza, the teams go back in opposite ways but they don’t do another show then. Enjoy!